Sun symbols belong to the oldest of all symbols that people have carved on stones, rocks, and bones. The solar wheel as sun symbol was worn as a talisman and buried with the dead. Celtic coins were struck with sun symbols associated with the Horse, a solar creature in the Bronze Age and the Celtic period. The circle with a center is still used today in astronomical calendars as the sign for the sun. 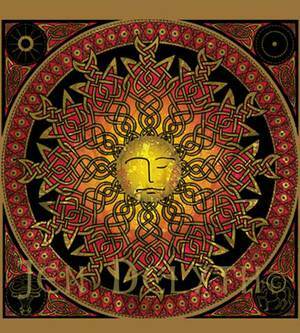 The celts did not worship the actual physical sun, who was not represented by any one particular god or goddess. The venerated spirit and power of nature in all things, and many gods and goddesses embodied the divine qualities of the sun- life, light, healing, inspiration, strength, (inner) fire and illumination. Some of the main solar divinities are Sulis (from Suil, meaning both 'eye' and 'sun') and Lugh- Welsh Lleu (Bright one). The Welsh sun god Hu is a bull called 'the mighty Hu'. The four great celtic festivals (Samhain, Imbolc, Beltane and Lugh-Nasadh) were perhaps markers of the solar year, with fires lit at Beltane (means 'bright fire') to mark the return of the sun, and encourage the fertile warming force. In this design, the twelve fiery rays of the sun represent the modern zodiac. The double spiral and rhomboid patterns are ancient dynamic sun symbols, representing the seasonal growth and then waning of the sun's power. The chain of joined rhomboids is the symbolic image of the ongoing chain of sun years.